We've all heard that Maui is the best, but I've been a bit slow to realize it myself. Many Maui pilots have flown with us on Oahu, and many of our pilots have flown over there, but somehow I've never made it back over there in the 18 years since I got my training flights there with Pete. I guess I'm just a stick in the mud. So when Garrett told me the weather this past weekend looked promising for crater flights, I figured I'd pass once again, but he persevered and fired up at least ten of us to head over, including five first timers. 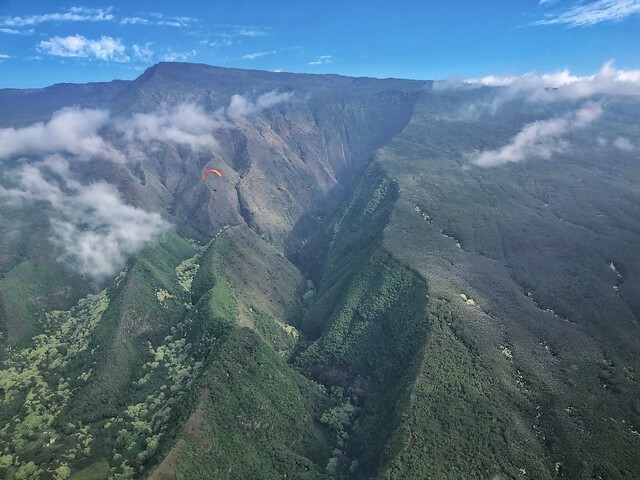 We coordinated with Maui pilots for advice and guidance, and we were rewarded with fun thermal flights at the L above Lahaina, and a couple days of surreal and scenic extended glides down from the crater, to both Kaupo and to Kula. I definitely won't wait 18 years for my next trip! Thanks to Maui pilots for their hospitality and aloha! And thanks to Kevin for sharing some his footage for my video! So great... Thank you for sharing, see you guys in April. The FOMO was heavy on this one. I see now it was not just "fear" but reality. Thanks for sharing.